The effectiveness of your Board has a direct correlation to the understanding and application of strategy and governance. Why? Because strategy and governance play absolutely key roles in the effectiveness, efficiency and usefulness of individual Board Members and the Board as a whole. Hence, recent strategy evolution is important for all Board Members to understand. The 1990s through the 2010s are known as the ‘Strategic Proliferation’ phase of strategy. This strategy phase shows a combination and joining of 3 concepts: a) build on what you already do, b) do something new and c) react opportunistically to emerging possibilities. This proved to be a very balanced approach in theory – all three of these areas seemed achievable. Unfortunately, as the phase is titled, I have grown to be weary of the word ‘proliferation’ as it typically is not used with positive connotation. That is a shame due to the fact that the word implies availability and abundance. It is ultimately what we do with that availability and abundance that can sway the word to the positive or negative side. My weariness is warranted in this instance. Know that it wasn’t the actual strategy theory that caused trouble in this phase, it truly was the proliferation of countless sub-strategies that caused the issues. The proliferation of sub-strategies, made possible by the internet, caused difficulty for many companies when attempting to choose the right one. 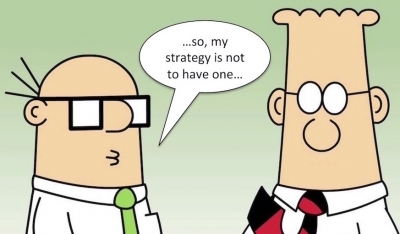 Companies that did their homework and right-sized their strategy methodology did well. However, if they did settle and hastily make a decision, their chances of kicking-off a strategy or strategic process that did not directly fit their business or industry was high. And, as the available strategies multiplied, so did the complexity. This period of strategy evolution rendered many companies in a paralysis state and led to billions of dollars in failed initiatives. There existed other headwinds, also. Michael E. Raynor, author of ‘The Strategy Paradox,’ shows a fascinating collision between commitment and uncertainty that reared its head during this timeframe. Phrased in a question, “how does a leader make choices based on assumptions about a future they cannot predict?” A paradox indeed, but not something that hasn’t been encountered before. The only difference now is likely the accelerating speed at which the unpredictable future is heading towards you. The current evolution of strategy of the 2010s (or post-2010s) actually doesn’t have a globally-accepted phase-name currently. Even so, I have begun to call our current phase ‘Amorphic Strategy’ in speaking engagements. It just seems to be such a fitting name based on all of the new and moving parts within modern day successful strategies - the fluidity and shape-changing properties that force strategists, Boards and leaders to weigh against seemingly multiplying data and risk/reward inputs. Strategy of today is unequivocally different than in the past. Why? Because the application of strategy is now applied to everything from the most mundane single task to the most highly complex program. Strategy is no longer applicable to only those areas that have a defined budget, scope and timeline associated with them. Strategy has become commoditized through advancements in disruptive technology and most importantly, progress in artificial intelligence, big data and machine learning. The ability to simultaneously build a strategy and ‘grade’ its likelihood of success as well as risk of failure prior to implementation is no longer science fiction. Add geopolitical influences and generational motivations into the equation and the need to adapt a strategy more quickly to change becomes paramount. All of these inputs add to the concept of ‘simultaneity,’ the relationships between multiple events happening at the same time, and deserves a strategy within itself! The point of the history lesson and current evolution overview of strategy is to illustrate the current speed of change and accelerating knowledge-base in this area. Boards and more specifically, individual Board Members, are limited in their effectiveness when they lack an in-depth understanding of strategy, where it came from and where it is headed. Does your Board have a high level of strategic knowledge? Reach out directly to Mark A. Pfister to discuss your Board's strategic proficiency.